Andrew ross sorkin: verizon’s new ceo taking over the reins just two weeks ago. 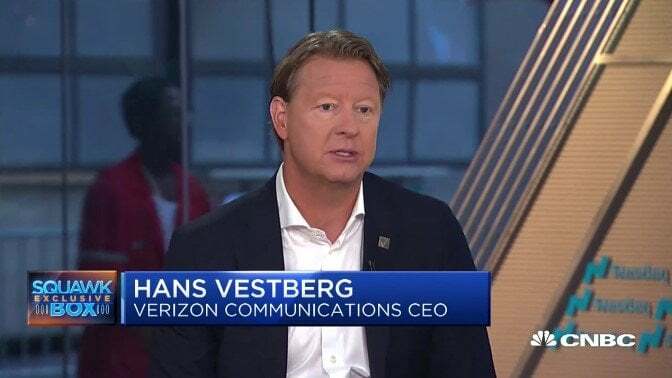 And joining us now for an exclusive interview on his plans for the company starting big news with 5-g: Hans Vestberg is here, Verizon new CEO, formerly Verizon chief technology officer. Thank you for being here on this morning. Sorkin: we have about a million questions. But do you want to start with the 5-g news? Vestberg: yeah. So what we announced yesterday was our fourth city that we’ll do residential broadbanding with 5-g, and that’s Indianapolis. We have already announced Los Angeles, Houston and Sacramento. And we want to launch that this half-year. So, it is exciting. We’ll be the first in the world. Sorkin: so here’s the fundamental question of 5-g. And Joe and Becky and I were talking about this is during commerical break in the 6:00 hour, which is: do you believe that 5-g is fundamentally long-term going to up end of what may be described as the traditional cable business. Now I’m thinking of the parent of this network Comcast, Charter, effectively everybody. Does the technology of being able to effectively cut the wire up end the business -- or and I’ve heard Brian Roberts say this before, you will always need the wire or at least wires under the ground. That ultimately 5-g or any wireless technology are still based on getting as close to the home as possible? Sorkin: but it’s also going to be all of the internet of things. Vestberg: now we’re talking about different types of spectrum. Vestberg: millimeter – spectrum very high up, so of course, the distance is short. But the throughput is enormous and that’s what we are using for some of these use cases on fixed wireless. Becky quick: can I just ask a stupid question, though? Quick: because I’ve got phones – both Verizon and at&t cell phones. I’ve got Verizon FIOS as I was telling you, at my home, beforehand. Vestberg: -- the slices – differently, so of course, you’re going to get the connectivity that is 100% all of the time. That’s the -- and the speed that you have never seen before wireless. That’s what we are going to do. The limitation is going to be that the 5-g is coming into the home and then Wi-Fi is spreading it in the home. And that’s the limitation basically because you have one gig coming into the house. Sorkin: realistically, how quickly is 5-g going to emerge as a real technology, not just in a handful of cities but on a nationwide basis? And this goes to the larger debate, not just about the investment you’re going to make, it’s about the investment at&t is going make, it is about whether we ultimately think that regulators will want to approve the sprint t-mobile deal which I want to get to it in a minute. Sorkin: what do you mean some time? Is that a three year project or is that a decade? Vestberg: no, no, no. We are building everything right now. I mean we are going to have mobile phones in the hands of people in the next year that is 5-g.
Kernen: and it will cover everybody? -- look, it’s --- it’s -- so to cover everybody and make it usable, how much money for the industry are we talking about? Just an estimate? Kernen: hundreds of billions of dollars. Vestberg: no, I think it’s the same – remember the four era. Kernen: how much did that cost? Vestberg: no. The enormous spending that we’ll have today, we will – I’m not guiding what we’re going to do next year, but we have seen the last couple of years the very seamless investment in cap ex, even though we’re investing in lots of 5-g right now. You need fiber. You need passive equiptment. You need switches. You need a lot before you come to a radio-based station, which is a small piece of the total investment. Sorkin: let me ask you the big question which is this sprint t-mobile proposed merger. One of the thesis around this transaction is that they can effectively catapole the industry into 5-g on a nationwide basis in a way that they would not be able to independently and that they are going to actually be able to put more pressure on you and at&t to do so as well. Is that accurate, or no? Sorkin: do you think they have better spectrum? Vestberg: spectrum you know is just one piece of transporting data, identification is not there. Technology advancement is the third. The combination of the assets we have is very very well fit for the 5-g.
Sorkin: do you think that is a transaction that regulators should approve? Vestberg: again, you should ask regulators, I am not the regulator. Sorkin: I am assume you have a team in Washington who has commented or have been asked to comment on this transaction. What’s the official position of Verizon? Vestberg: we are neutral. We’ll let the ones that know about this, I will let them decide. I have no opinion about it. We’ll let that go. Sorkin: -- a path that focuses on being the transmission mechanism as opposed to one transmission plus content. At&t clearly has moved towards content. Comcast has moved towards content. And you know there is -- people say do you want to be the dump pipe, and by the way, there more be more value to being the dump pipe, or other people say they want to actually own the content that’s on the pipe. How do you think of those two? Sorkin: does it put you at a competitive disadvantage? Vestberg: no. I think that we’ll compete with what assets we have in the market we have. We are going to see differentiation from different carriers. It’s not – nothing strange. Kernen: are you envious of at&t’s asset composition? Vestberg: as I said, I’m very happy with our assets. Kernen: really, so you’re not. Vestberg: no. I think that that’s going to happen. There are so many choices when you go into 5-g. So you can play in so many different areas. We have chosen where we’re going to be with great assets. And what’s what we are happy for. Quick: what does it mean for oath? Vestberg: oath is definitely a very important piece of it. First of all, fantastic combination of both a.I. And m.L. That we need in the network. And then on the front end we have distribution chain of wireless and wire line and we have of course the whole oath and of course doing things in between them is important. Quick: so it is not for sale? Vestberg: no, it’s not for sale. I’m not sure where you got that from. Vestberg: it’s nothing I have heard about. No. Sorkin: you haven’t heard about that. Kernen: 20% spin-off so that you can have stocks issued to employees to keep them there. Vestberg: no, nothing I have heard about. But it is all about the rumors. Vestberg: of course -- we are happy -- I think about that. I studied all carriers in the world for many years. I mean, it is just the moment of the industry where you are going to have different choices. So I don’t think that you say somebody is stupid because they did that or that. Everybody is going to bet on their assets how they do it best. Verizon is taking the bet with our assets which I am really happy about it. So I don’t think you’re going to look back in ten years from now – I mean, remember, ten years ago every carrier looked exactly the same -- the same offering. You didn’t need a segmented carrier business. Today all carriers are doing differently. Which is not strange. Kernen: -- you don’t sound like you need a big acquisition obviously. But looking at the at&t deal ones and again going back to that and now the appeal. Do you think there is merit in the appeal of the department of justice or do you think I got it right in the first place? Do you think at&t has been unfair managing and pricing now that they have those assets? Vestberg: no, I would not go into comment on that. Kernen: you have to be careful because you might want to do something like that. Kernen: you are the chief technology officer. We have 30 seconds left. Can you explain to me how 5-g works. Just quickly? Just exactly -- I need the detailed explanation. Do you understand it, Sorkin? Do you understand it? Sorkin: I think I do. But if you can give a lesson by all means. Kernen: I want to know how it works because it is wireless. It’s going through the ether? -- is it magic? Kernen: I think it is magic. I know there is scientific basis for it but it is amazing. Vestberg: it is amazing that you can bring out 7 gigs on a wireless line. It’s fantastic. Sorkin: before we let you go, just from a management perspective, how do you think you are different than Lowell McAdam? Vestberg: I am Swedish. – no. Of course I am different. We are different backgrounds. But the great thing is that we have a common mission on where Verizon should go. We spent a lot of time together over the last 14 months but over 10 years we spent time together. So of course, I am different. I am trained in a different way. I come from a different environment but we share the same visions and same ambitions for Verizon. Sorkin: ok. We’ll end the conversation there. Thank you for coming in. Sorkin: let’s make this a regular thing.